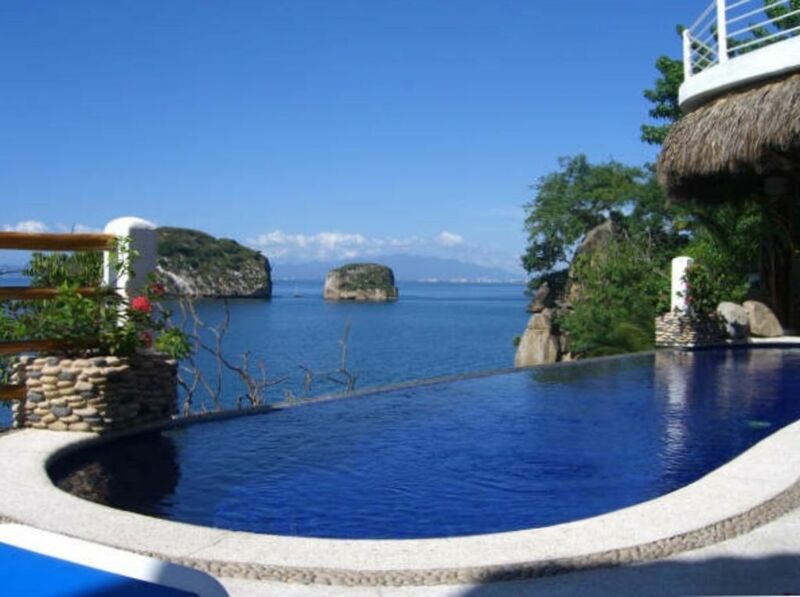 Casa Azul Profundo is a spectacular oceanfront 15 bedroom villa perched on a rocky cliff overlooking the spectacular and famous geological landmark Los Arcos, 5 miles south of downtown Puerto Vallarta, next to the Mismaloya beach. 1 King bed, A/C, Ceiling Fan, Full Bath, Ocean view. 2 King beds, A/C, Ceiling Fan, Cable TV, DVD, Full Bath, Ocean view. Other amenities of this villa include: 1 swimming pool, 15 bathrooms, 1 Jacuzzi, Air-conditioned Bedrooms, CD & DVD players, water, Free WF Internet access, 2 dining rooms, 2 living rooms, 2 full kitchens, 3 Ocean view terraces, Ocean View Bar, 2 BBQ, Parking for 5 cars etc. 15 Bedrooms Oct15-Apr 30: USD 3.500; Apr 30-Oct 15: USD 3200.00, Holidays:4650.00. In order to confirm your reservation we require 50% of the total rental rate and the other 50% 60 days prior to your arrival date. Special arrangements may be made upon request. No. We only rent the villa to one group at a time. If you rent less than 15 bedrooms we simply lock the rooms that are not being used. We do not offer transportation services as part of the villa. However, we can make arrangements with a local van company that can pick you up at the airport and take you to the villa and vice versa for approximately $15-20 dollars a person depending on the number of guests. Can I have my wedding at the Villa and what is the capacity? Can you assist with wedding preparation? Yes. You can choose to hire the caterer and other wedding vendors and bring them to your event or we can recommend local vendors that have previously held events at our house. There is no extra cost associated in assisting you in coordinating your event. Can you help us arrange other activities while in town? Yes. We can help you arrange any other activities while in town such as fishing trips, snorkeling trips, zip line excursions or any other service you may need. CANCELLATION AND REFUNDS – Cancellations made prior to 150 days of arrival date will be assessed a 15% handling fee (of total rental amount) which is a cancellation fee. Cancellations made after 150 days prior to arrival date will be assessed a cancellation fee of 100% of total rental amount. However, if we successfully re-rent the villa for all or any portion of the reserved time cancelled, we will reimburse the amount collected for that time less the 15% handling/cancellation fee. If we can’t re-rent the villa Azul Profundo we will allow the guest to use the reservation during the upcoming 24 months from the original reservation date excluding the holiday season and the high season if the reservation canceled was during the low season period. All cancellations must be in writing. Failure to notify us of any cancellation in writing will result in a 100% rental fee forfeiture without re-imbursement for any reason. In case the number of guests and / or rooms decreases, Casa Azul Profundo is not responsible and the money paid will not be refunded (some exceptions apply). It is the responsibility of the client to book the house with a secure number of guests to avoid future inconveniences. Casa Azul Profundo ensures a dazzling ocean view, privacy and exclusivity. The view from our place is truly unique. We also a have a great staff including a world class chef and a very unique Barman and attendance, Roger, who is very popular among our guests. We have a special table that we can set up every day that gives space for 25+ people. The rental includes the preparation of 2 meals per day. There is also the option of having 3 meals per day. The cost of the food is not included, we can buy them at cost for the guest. Wow- what can I say? This place was everything that was promised. All of the wonderful reviews are indeed true. We used this home for a 6 day wedding getaway with our closest family and friends. Roger and his staff were amazing. Upon arrival, Rodger makes everything very easy. The house is stocked before your arrival with your grocery/beverage requests and grocery shopping is done daily. Roger provides thorough tracking of receipts to make sure you know where all your money is going. Roger even had answers to our most random questions or requests. The cooking was phenomenal. We opted for breakfast and dinner most days, and were never disappointed. Also, Rodger's staff is very good with incorporating leftovers into the next meal to help save money and prevent wasted food. The views are extraordinary and we saw whales from the patio almost daily. It's approx. 10 minutes from the wonderfully quaint public beach. Our group did a number of excursions on the water with local guides, and found everyone we dealt with to be very pleasant. Our group was very impressed with the accommodations, and everyone enjoyed their rooms. We HIGHLY recommend this house for whatever event you're planning. We had a group of 25 adults, and 5 kids. The predictions of it costing around $20-25/person/day we found to be pretty accurate (our group were big fans of the Corona). We felt very safe at this location and felt that the staff really cares that everyone is enjoying their time. We hope to return again in the future! Sarah, thank you so much. Nothing more satisfying for us than having our guests happy! And the staff truly deserves a medal for making it possible. We can not be more pleasanted to read that you got what you were promised, a perfect wedding getaway! Thanks for trusting on us, we hope you that you retrun to he house soon, you are always going to be welcome! Best, Fernanda and Simon. All meals were dictated by what we told staff and served at the time we requested. (Some days we needed to sleep late - something about the tequila, I guess.). Food was delicious. One morning we saw two whales as we ate at our outdoor dinning area. Best part of the trip was Roger, the property manager. He knows everything about the area, can arrange taxis, boating, surfing, bungee jumping, etc. He listens and does anything requested in a most friendly and-cordial manner. The entire staff of 4 is equally as accommodating and friendly. By the rime we left we all felt as if we had made new friends, particularity with Roger and Aaron. Carl, we are the ones who can not thank enough for your amazing words to the house and the staff! If there is something we really appreciate is to have guests who take care of the villa and enjoy the experience while being there and we know this was the case. Roger, Aaron and the rest of the staff are always pleased to attend house's guests, especially when they have guests as you. We hope you decide to return for another amazing vacation at Azul Profundo. Jimmy , Mary and Lily very professional and at the same time made us all feel like family. Azul Profundo is a beautiful property with views which are unprecedented of the bay and Los Arcos. There really are no bad rooms, something for everyone, very one clean and attractively decorated. The common area large enough to handle our group of 22 adults and to small children. The staff Jimmy our house man, Mary our chef and Lily our house keeper where in the top 3 staffs we have ever had in Our 11 trips to PV. They were able to answer all our many questions and able to complete all our request, from trips,food, transportation or places to go in town. My biggest surprise was that they knew some of the same people I have met and made friends with in my past trips to PV. As we all gathered to leave for the airport to go home it felt like we were leaving the home of a relative. I hope to repeat this experience with my family and new friends (family) of Azul Profundo in the future. Thank You Simon for a experience with my family I will cherish forever. We wish you all a Merry Christmas and a Happy New Year. Thank you again Richard D. And family. Richard and family, thank you so much for taking the time to let us know what your experience in the house felt like. For the many times we know you have gone to PV, it means a lot for us that our staff had accomplished your expectations. We really hope to have you and your family back to the house. You were incredible guests! Thank you. What a great place to gather and enjoy the AMAZING views from every room! The service from Roger (house manager) and the two staff that cooked and cleaned was fantastic. I’ve never received better service than this staff. Things to be prepared for: if you are utilizing vans to transport your group to and from town and to and from the airport, budget a great deal for transportation. We were charged $20 pp for round trip transportation to the airport. Every trip to the marina or into town was per person and pricey. Taxis are pretty reasonable and the local bus is very economical. The home is beautiful but is due for some refurbishment. The furniture and window coverings in many of the bedrooms has seen its better days. BUT these things can be easily be overlooked by the exceptional service, good food and amazing views. I look forward to enjoying this villa again in the future! The house has amazing views and a wonderful pool. The rooms were clean and spacious. The staff was very kind and helpful. It is about 15 minutes to the Old Town but about 25 minutes to the Romantic Zone. They connected us with a taxi company that had taxis and vans. If you take a taxi it is a fee for the taxi but if you take the van it is a per person fee. We had a group of between 12 and 8 on most rides. Because the property is not in town we spent a lot on money on transportation. Not a criticism but something to be aware of. The cook made some good basic food but we had more diverse meals in town. Overall it is a great spot to just relax. We had a group of 21 people for 5 days to celebrate my husband and I’s wedding this past week. I have never left a review, but after the experience we had it would be a shame not to. Roger (Manager) - This man is awesome. He will make sure your every need is taken care of, from fresh towels to mealtimes to trips into town. He made meal planning and logistics a breeze, we always had enough food for each meal without tons of excess, and renting boats or calling a taxi was easy. He is a true professional. Selena (Cook) - She can and will cook anything for you. Amazing meals that were always ready in time. She was very flexible to our vegan and vegetarian eaters. Miguel (Bartender/Server) - If you needed a drink, he was on top of it. Made one of the best Pina Coladas I have ever had. Everyone in our group loved him. Rooms - Each room had an amazing view and came with its own bathroom. My favorite bathroom resembled a jungle with a living wall in the shower. It was hard to choose which room to take, as all of them had something you wanted. Main Area - This is where our group spent most of the time. The pool is bigger than the pictures lead you to believe and the views from the living room are to die for. Dining Room - I didn’t even know this area existed when I looked at the photos online. This area was recently built and it is huge. This area has a ton of space that can be used for multiple purposes. This area also leads up to the rooms that were recently built, which we nicknamed the west wing. Boats - To rent a boat for a few hours in town is expensive. However you can just use Roger’s brother Danny or Selena’s husband Caesar for a much better rate. Each boat can hold roughly 15 people and can be used to access remote beaches, snorkeling, or even fishing. Our stay was fantastic from the moment we reserved it. Not only will Simon, the owner, respond quickly to any and all questions but he is also very accommodating. When we arrived at the house the staff was ready to help us with everything we needed and more. By the end we almost wished we didn’t go there because now we feel spoiled. This mega-mansion had it all, we will be back! Specific Rate Information: 7 bedrooms: 1310 low season // 1560 high season 8 bedrooms: 1,570 low season//1,870 high season 9 bedrooms: 1,890 low season//2,190 high season 10 bedrooms: 2,100 low season// 2,400 high season 11 bedrooms: 2,400 low season// 2,720 high season 12 bedrooms: 2620 low season// 2920 high season 13 bedrooms: 2800 low season// 3190 high season 14 bedrooms: 3000 low season// 3390 high season 15 bedrooms: 3200 low season// 3500 high season. CANCELLATION AND REFUNDS – Cancellations made prior to 150 days of arrival date will be assessed a 15% handling fee (of total rental amount) which is a cancellation fee. Cancellations made after 150 days prior to arrival date will be assessed a cancellation fee of 100% of total rental amount. However, if we successfully re-rent the villa for all or any portion of the reserved time cancelled, we will reimburse the amount collected for that time less the 15% handling/cancellation fee. If we can’t re-rent the villa Azul Profundo we will allow the guest to use the reservation during the upcoming 24 months from the original reservation date excluding the holiday season and the high season if the reservation canceled was during the low season period. All cancellations must be in writing. Failure to notify us of any cancellation in writing will result in a 100% rental fee forfeiture without re-imbursement for any reason. In case the number of guests and / or rooms decreases, Casa Azul Profundo is not responsible and the money paid will not be refunded (some exceptions apply). It is the responsibility of the client to book the house with a secure number of guests to avoid future inconveniences.